The Georgia State University Library’s Research Data Services (RDS) Team offers a wide variety of workshops on data analysis tools & methods, mapping & data visualization, finding data & statistics, and survey design. This Spring 2019 semester the RDS Team is offering 54 workshops — the most offerings we’ve had in a single semester to date. We’re even offering some evening workshops this semester to better accommodate campus researchers’ needs. Why should you attend the Research Data Services (RDS) Team’s data workshops? Data skills — even just basic data skills — are highly valued by today’s employers — being called “the most lucrative skill[s] to have” and “the most valuable skill[s] you can learn.” So, attending our data workshops will give you a leg up once you’re out there looking for a job. So, the 54 workshops that the RDS Team is offering for *FREE* in this coming semester equates to an average $5,940 total cost at the market price, and it could range from $3,294 to $10,800 in total cost. Register for Research Data Services (RDS) workshops on the Library Calendar. Look for the logo with the GET DATA CERTIFIED seal (see image at right). Attend a minimum of five unique RDS workshops in the Spring 2019 semester. While you’re welcome to attend the same workshop multiple times to hone your skills, to earn the data certificate you need to attend a minimum of five *unique* workshops. By April 24 if you’ve attended a minimum five workshops, you’ll be invited to a ceremony in the Library (date TBD) where you can mingle with others committed to getting RDS@GSU Data Certified *and* receive a custom certificate signed by our Dean of Libraries and the Leader of the Research Data Services Team (see example below). Yes, it’s that easy! And by getting RDS@GSU Data Certified, you demonstrate to potential employers that you are committed to growing the data skills that they look for in hires. 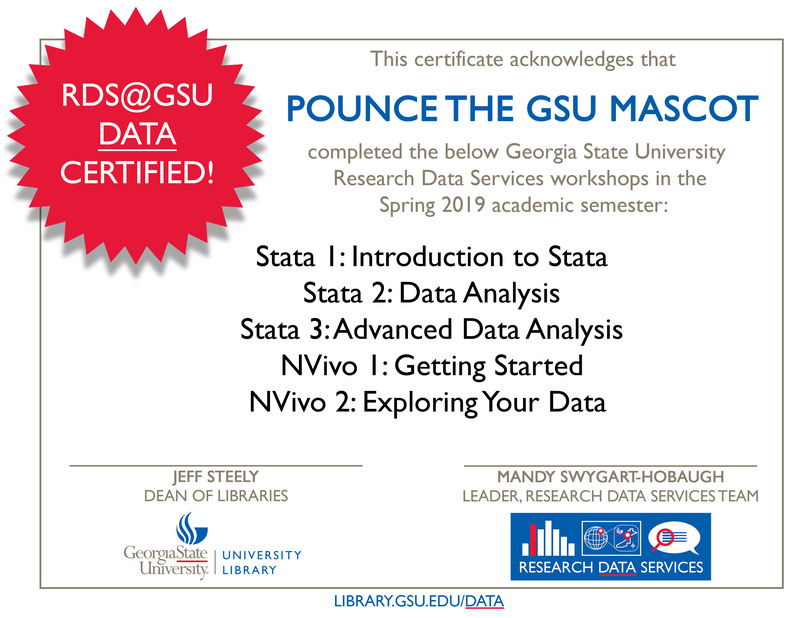 So, get RDS@GSU Data Certified! It’s free, and it’s worth it.